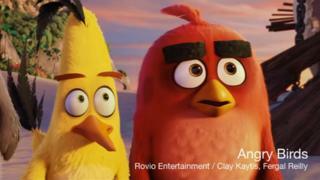 A cinema which screened a trailer for an 18-rated horror film before the Angry Birds Movie has apologised after young children were "left in tears". The Cineworld branch accidentally played the trailer for supernatural chiller The Bye Bye Man to the young audience. One mother has accused the multiplex, in Didcot, Oxfordshire, of "traumatising" youngsters. The firm blamed human error and said it was reviewing its procedures. A spokesman said the cinema had given customers full refunds. Mother-of-four Claire Wren said her children, who are all under 11, had to cover their eyes during the trailer. She said: "My 10-year-old has Asperger's and it has taken a long time to get used to the cinema. "She just absolutely lost it and was sobbing and screaming 'get me out of here'." Phil Clapp, the chief executive of trade body the UK Cinema Association, has been in touch with the cinema after being contacted by the British Board of Film Classification (BBFC). He said: "No advert can be played that is of a higher classification than that of the main picture, but on this occasion that is what appears to have happened. "An advert pack with adverts at a higher classification than the film was inserted by accident. "Now they are looking to tighten up the processes within the cinema to make sure it doesn't happen again." A Cineworld spokesman said it was reviewing its procedures and added: "We are really sorry for any distress caused and have apologised to the customers affected."